I bought another section of shan yao from the Korean market this week. I’m still experimenting on the best way to cook and eat it. I also picked up some pre-cooked food from the Korean market. The pre-cooked food sat on a bed of shredded cabbage. 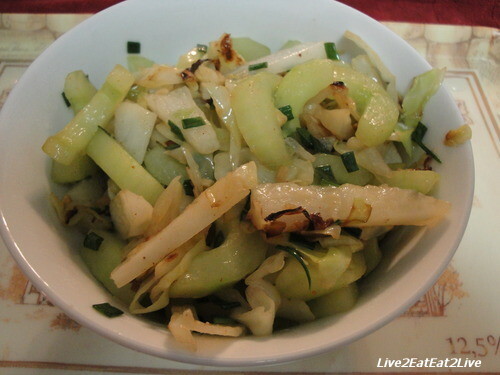 Not wanting to waste the cabbage, I did a quick stir fry with the cabbage, a cucumber, and a little bit of shan yao. I added some green onions from our outside flower-pot. I seasoned the stir fry with sugar, salt, and chili powder. It went very nicely with the kim chee fried rice I also purchased at the market.